Chinese Super League club Guizhou Hengfeng who are currently at the foot of the Chinese Super League has dangled one of the biggest carrots possible in front of their players in an attempt to stop them being relegated. They will pay out around £1.1 million per win to the squad, with one catch – money will be deducted if they lose games. They don’t even have to wait long for the reward to be handed over to them if they win as the cash will be in the dressing room waiting for them. The team will earn around £230,000 for a draw but they'll be deducted £115,000 from their wage if they lose. The team were treated to a lavish dinner by the clubs owner where the proposal was announced and accepted by the players and staff. Guizhou who is currently 9 games into the new season has only won 1 and sit bottom on 3 points. Property tycoon Wen who owns Guizhou Hengfeng has said that he, “wants the team to forget about all their losses and think only about hard-won victories.” We are sure that the proposed 1.5 million dollars a win will also help them think about hard-won victories. We won’t be surprised if Guizhou Hengfeng starts winning games all of a sudden and charge up the league. 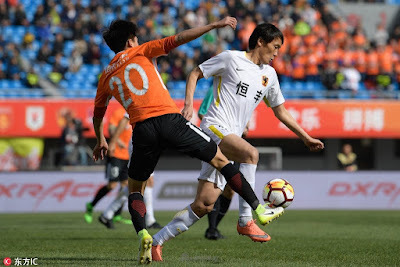 Next up they will face Chinese Super League leaders Shanghai SIPG which will provide a first stern test in an their attempts to start winning that lovely prize – otherwise known as a big bloody pot of cash, there best chance to get their hands on it comes the following weekend when they take on Dalian Yifang who are also struggling at the bottom of the league table. As the side lost 5-1 last time out to Tianjin Teda they will be hoping the money helps motivate them.